Himalayan bio-diversity always brings out a kind of mystique, that's impossible to find anywhere else in the world. Corbett National Park, based at Ramnagar, 250-kms northeast of Delhi and 63-kms southwest of Nainital, is one of India's premier wildlife reserves. Established in 1936 by Jim Corbett among others, as the Hailey National Park, India's first, and later renamed in his honour, it is one of Himalayan India's last expanses of wilderness. Defined by the dazzling high ridges, glaciers, deep gorges, alpine meadows and valleys with closed virgin forests, the Great Himalayan National Park with an altitudinal variation from 1,300m to 6,100m in Kullu district is one of the best destinations for Himalayan flora and fauna lovers. Supporting a diverse Himalayan wildlife of over 300 species of birds and over 30 species of mammals, this region was declared a national park in 1984. 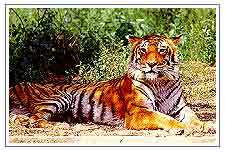 Namdapha tiger reserve in Changlang district of Arunachal Pradesh is spread in an area of 1,850-sq-kms rugged terrain. Perhaps no other national park in the world has a wider altitudinal variation than the Namdapha national park that rises from 200m to 4,500m in the snow-capped mountain. This variation has given rise to the growth of diverse habitats of flora and fauna. 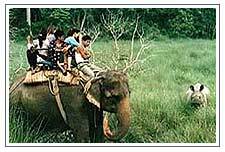 The Royal Chitwan National Park, established in 1973, provides a great wildlife experience with its rich flora and fauna. The wildlife and the landscape are not as breathtaking as those found in Africa but still, the experience will stand out. Short grass makes the months of February-May the best game-viewing season, but the autumn months are perfect for visiting, with Himalayan views, and in winter months of December-January, Chitwan has quiet a pleasant climate compared to Kathmandu. The Royal Bardia National Park is the largest and most undisturbed wild area of the Terai region of the Nepal Himalayas. Simialar to Chitwan park, but with a drier climate and a more remote location, Bardia encompasses 1,000-sq-kms of riverine grassland and sal forests.